The Air Ambulance attended a road traffic collision on the outskirts of Ballymoney this evening. One person was taken to hospital as a result of a crash between a car and a van on the Knock Road at around 4pm on Tuesday afternoon. The Knock Road was closed between the Lisconnan Road and Dervock as personnel from PSNI, the Northern Ireland Ambulance Service (NIAS) and the Northern Ireland Fire and Rescue Service dealt with the incident. 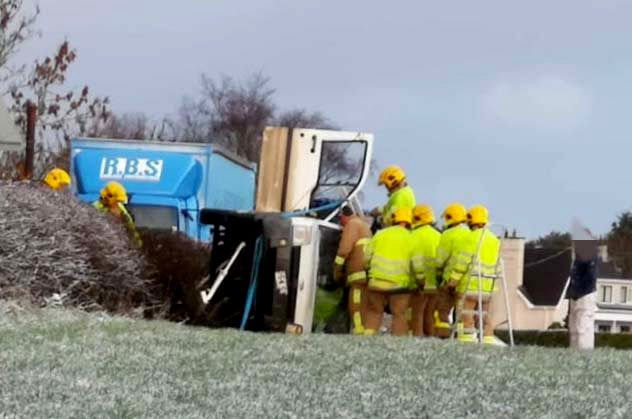 A PSNI spokesperson later confirmed that a vehicle driver was taken to hospital for injuries, which are not believed to be life threatening, as a result of the crash. Below, is a picture taken from the scene earlier today.